Preheat broiler. Broil meat 3-4 in. from heat on each side to desired degree of doneness (medium-rare, 135°; medium, 140°; medium-well, 145°). Cool and cut into thin diagonal strips. In a large saucepan, bring 1/2 in. water to a boil. Add asparagus; cook, uncovered, just until crisp-tender, 3-5 minutes. Drain and cool. 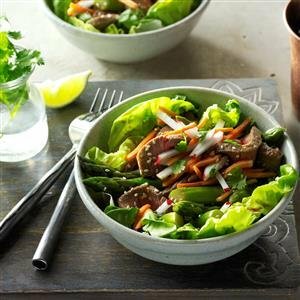 Combine beef and asparagus. Stir together soy sauce, sesame oil, vinegar and ginger; pour over beef and asparagus. Sprinkle with sesame seeds; toss lightly. If desired, serve on lettuce leaves with shredded carrots, sliced radishes, cilantro and lime wedges. Makes 6 servings.